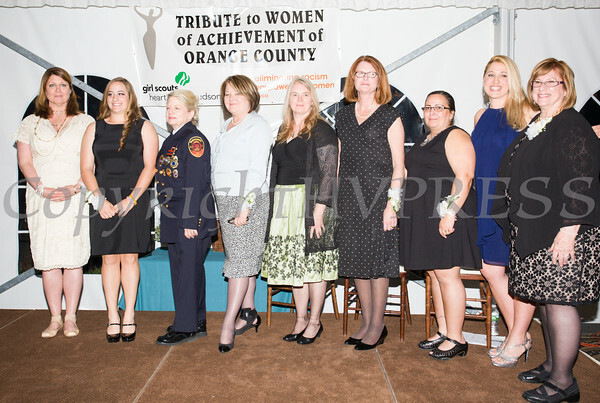 The 24th Annual Tribute to Women of Achievement of Orange County was held at West Hills Country Club in Middletown, NY on Wednesday, May 11, 2016. Honorees Patt Smith, Jillian Dolce, Robin Reynolds, Regina McGrade, Katherine Fox, Joan Cusack-McGuirk, Ranaye Corley, Kellyann Kostyal-Larrier and Willa Freiband at the 24th Annual Tribute to Women of Achievement of Orange County held at West Hills Country Club in Middletown, NY on Wednesday, May 11, 2016. Hudson Press/CHUCK STEWART, JR.